Exotic, luxurious, and with a great dose of elegance – this is how the Moroccan style can be described as succinctly as possible. This interior design trend makes use of vibrant colors and intricate details to create a mysterious and dramatic atmosphere in a home. It has become very popular in recent times as it can be successfully pulled off with a modern twist to enable your home décor to show off in a unique way. 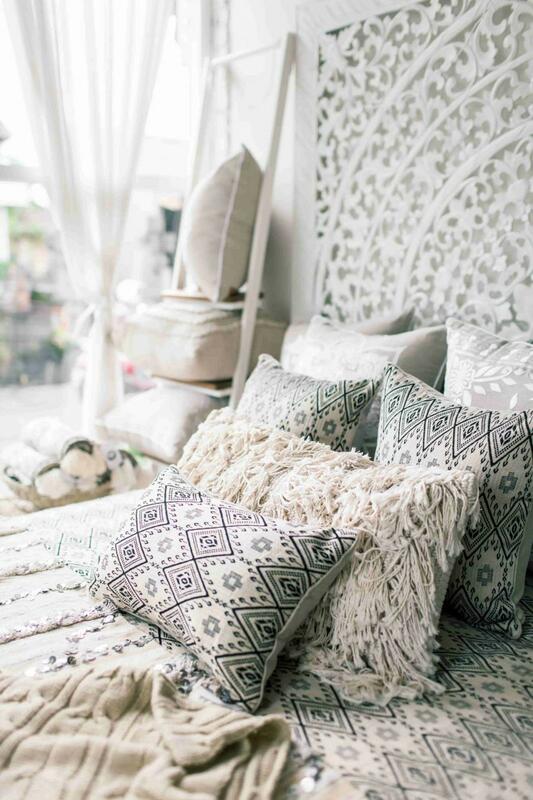 The Moroccan style is notoriously tricky when it comes to using it to decorate a room. This is mostly because the style is a blend of many cultures and you need to learn how to balance various exotic elements with complex textures and layers to create the true authentic Moroccan feeling. Using European styles with a mix of African and Islamic influences, the Moroccan look has some specific characteristics that you should be aware of if you wish to learn how to integrate it into your decorations. 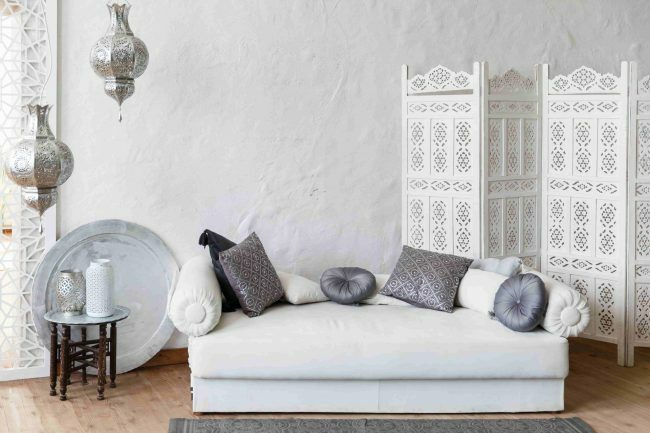 Whether you’re interested in some exotic accents or want to go all the way to do a complete makeover, this article will show you the best methods to decorate in Moroccan style. 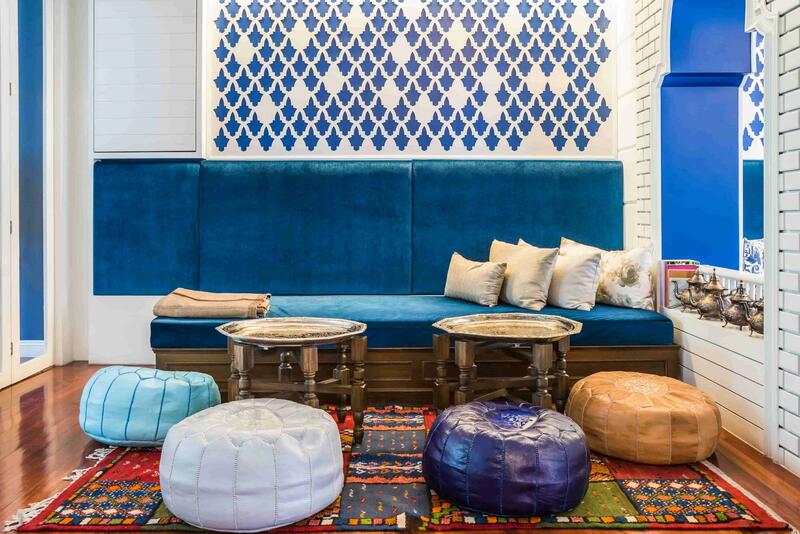 The Moroccan design style isn’t known for its subtlety when it comes to colors. Those who wish for their home decorations to make a bolder statement will be definitely pleased by the favored color choices of this style. 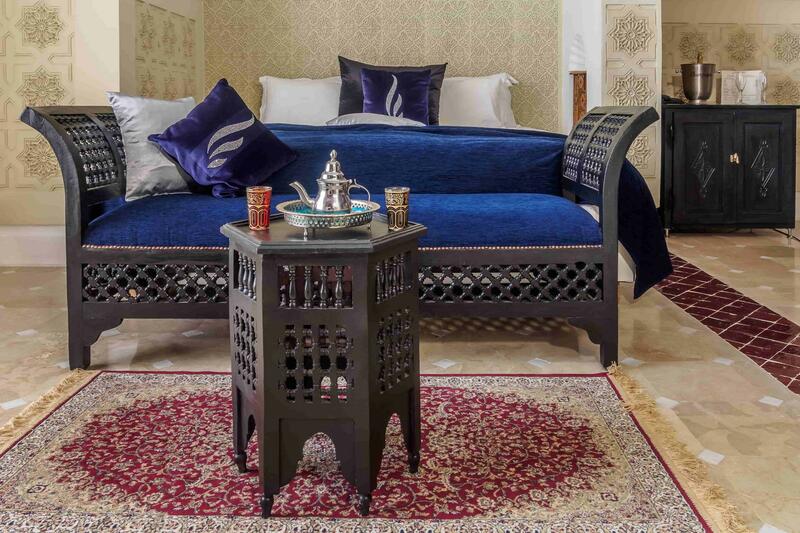 If you want to pull off the Moroccan look, you will need to focus on strong colors. Gold features quite heavily, as well as touches of silver. 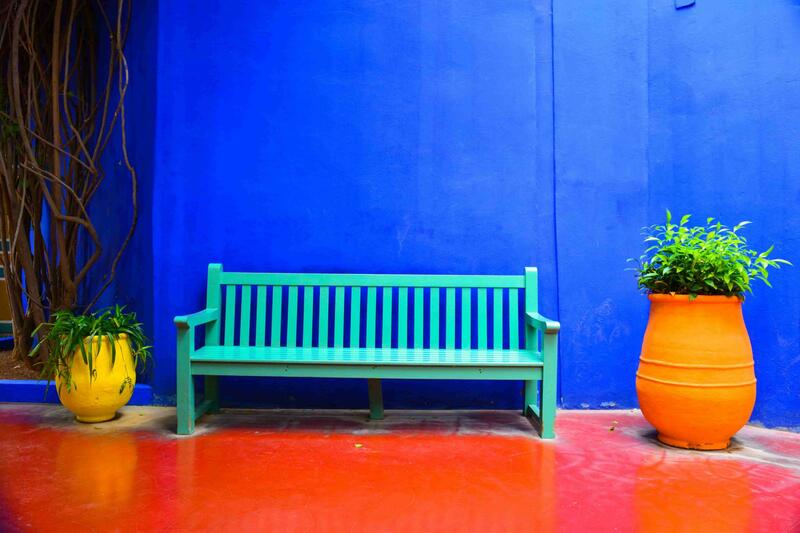 Go for imposing shades of blue and green and stunning hues of reds and oranges. To emphasize their strength as much as possible, it’s recommended to use backdrops with neutral tones of white and beige. You don’t need to go for a complete architectural makeover as it’s also possible to create this look by relying on colorful accessories. The downside is that you will need to work harder in other areas such as fabric styles and intricate details of certain pieces. Colors should usually reflect the brilliant shades of the ocean or the desert. Don’t limit yourself to subtle color accents through fabrics and upholstery. The walls and window frames can also benefit from the abundance of reds, blues, and oranges as well as other bold hues that dominate the Moroccan style. In terms of fabrics, the Moroccan style makes use of powerful color combined with rich texture to deliver its unique look. Silk and similar lightweight fabrics are some of the preferred choices as they’re used in multiple places from drapes to room dividers and more. Luxurious fabrics are draped over furniture pieces and elements such as cushions and poufs need to be upholstered with elegant patterns and designs. Fabrics should rely on exotic colors such as emerald green, amethyst violet, gold, and turquoise. For a very pleasant atmosphere, you should consider making a tented ceiling using fine silks which provide an airy feeling as they won’t obscure the light. 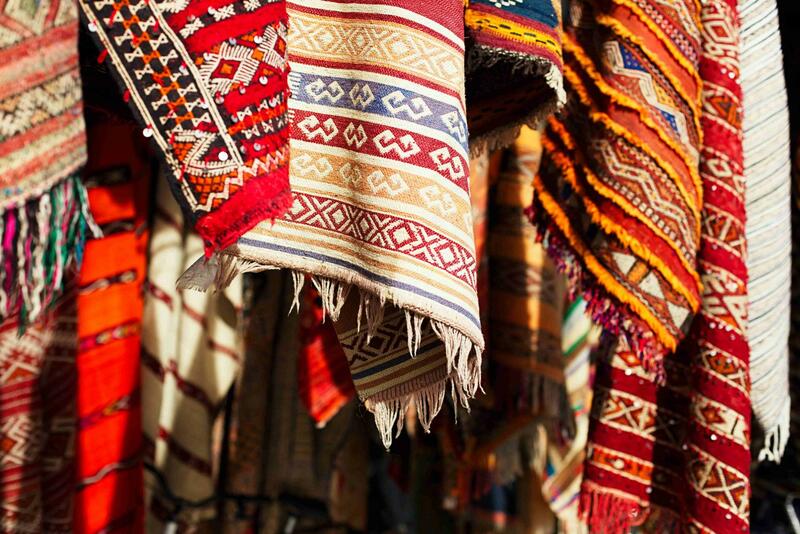 Rugs are a key component in the Moroccan design style. They bring a sense of tactility to the room and can really impress your guests through their distinctive patterned looks. Whether abstract or geometric, their patterns should be complex and full of vibrant colors. Here you can play around and add multiple rugs to suit any kind of room regardless if you prefer a more neutral or vivid color palette. One great option found on Amazon is this Moroccan rug. Furniture pieces in the Moroccan look need to have distinctive personalities through complex details, patterns, and textures. The main materials that you should combine are carved natural wood, stone, and metal. Things like coffee tables and chests are welcome additions for this design style. Accessories such as lamps can be made out of metal for a contrasting effect. There’s an important thing to mention regarding the decorations of furniture elements. While it’s recommended to focus on more advanced details, it’s also essential to keep the atmosphere of the interior place relaxing. A Moroccan-styled home should never feel too formal, so that’s why you should consider furniture pieces that are low to the ground. Room dividers represent another interesting way to add some more patterns in the Moroccan style. As they also cast beautiful shadows, room dividers are sure to enhance the atmosphere of any interior place. Try to choose wood panels with intricate carvings. These can also be used to keep the windows covered. As it has been previously mentioned, Moroccans prefer low seating. By recreating this type of informal look in your own home you can really bring out a signature element of this style. Instead of using a classic sofa you might want to just build a seating area. This zone can be traditionally formed from a large piece which covers a big chunk of space and smaller deep seats that keep the user close to the ground. 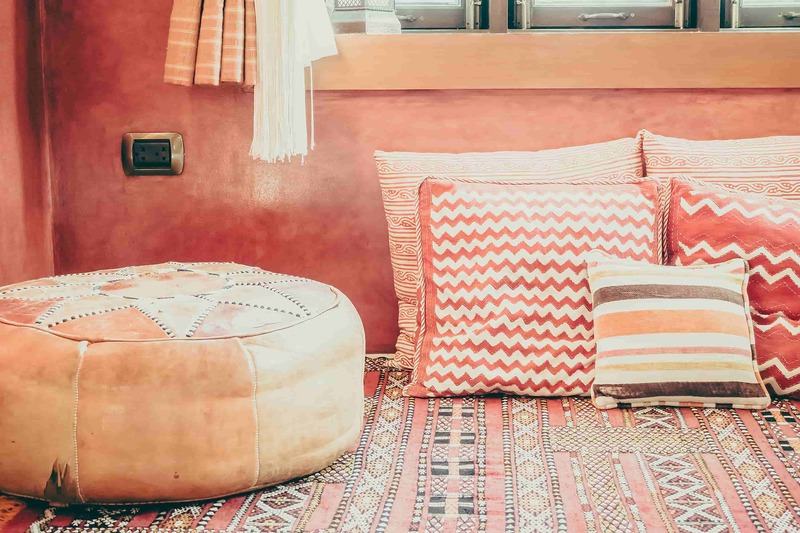 Incorporating a Moroccan pouf should be a top priority when you wish to add seating that’s both functional and stylish. Moroccan-style poufs can be used for impromptu seating and they’re usually upholstered with elegant details and vibrant patterns. This is a vital accent piece that should be crafted out of genuine leather. Here’s a handmade Moroccan pouf from Amazon that blends comfort with style. Armchairs can match well the aesthetic of the Moroccan style assuming they come with large seats and minimal backrest. It also helps if there are no armrests, or at least really low ones. Simply remember the informal principle to guide you when designing the seating. One element that contributes to the laid-back atmosphere would be a chaise longue. It offers some luxurious vibes thanks to its curving design which can match the exotic décor of this style. Another important detail regarding the Moroccan seating refers to cushions. Don’t settle for basic looking cushions or poufs. Try to find pieces with some bold-looking fabrics and vivid colors. These could be perfect to accompany the seating. 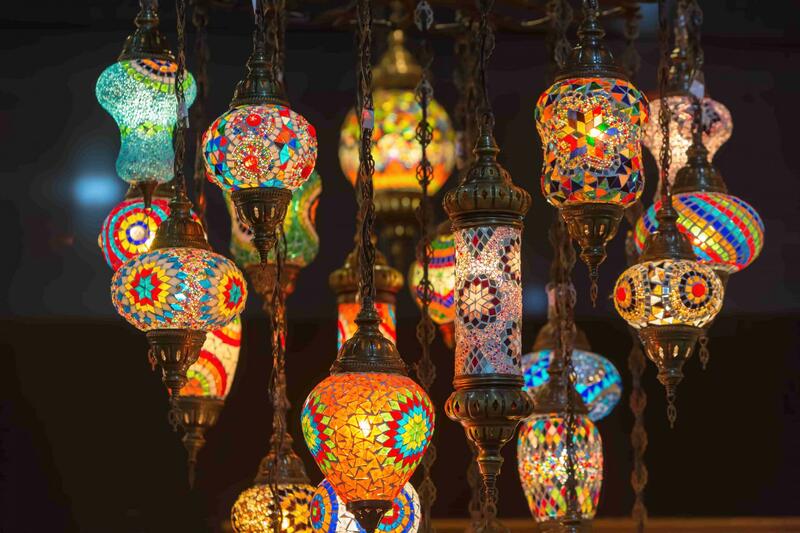 To transform the room in a Moroccan style, it’s crucial to make some changes to the lighting. 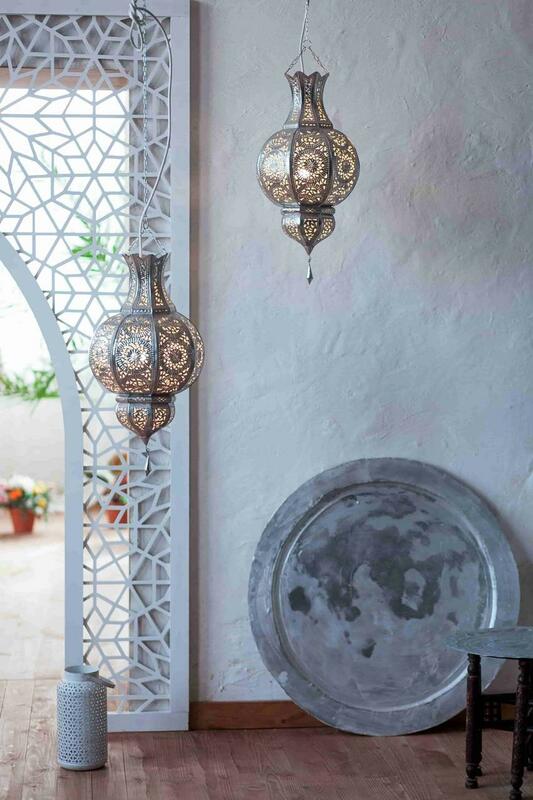 The simplest, but also the most striking way is to get a Moroccan lantern with distinctive embellishments. You should get a model made out of metal that’s easy to hang and which can create a stunning atmosphere with the help of colored glass panels. A good example is this exotic-looking Moroccan lantern from Amazon which comes in multiple vibrant color choices such as amber and purple. Another idea you could try is a pendant light that has a unique shape to make it stand out in the room. Whether it comes with a teardrop or curved design, the light should be kept dim and the materials need to match the rest of the décor elements. Hanging multiple lights in clusters is recommended if you want to create a focal point in a specific place. If you want to add a finishing touch, it can be a solid idea to place some large wall mirrors. By positioning them in such a way so as to reflect natural light, mirrors can enhance the ambiance and make the walls seem more adorned. Consider going for mirrors with more exotic oriental designs that rely on metal and jewel embellishments. Take a look at this elegant handmade metalwork piece from Amazon. Two defining characteristics of the Moroccan style are arches and mosaics. 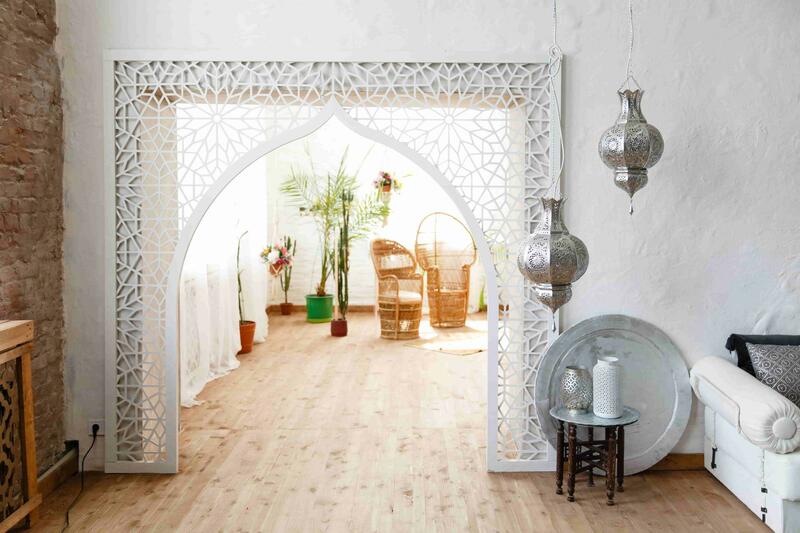 As this design trend has an Arab influence in terms of architecture, you can expect to find things such as arched doorways which add an intriguing point of interest. Mosaics are not only very beautiful, but they can offer your home an authentic Moroccan vibe. This design element can be used in a fairly versatile manner as you can incorporate mosaics into all kinds of surfaces like the floor or the walls. The great level of detail and color brought in by mosaics delivers a particularly nice effect for the kitchen or bathroom. We’ve already established that rugs are essential decorative pieces for your floors. The Moroccan style has another element that can be successfully used to embellish the floors. We’re talking about decorative ceramic tiles. This represents a popular flooring choice for a Moroccan home considering the cooling effect that fits well in the hot weather of Morocco. 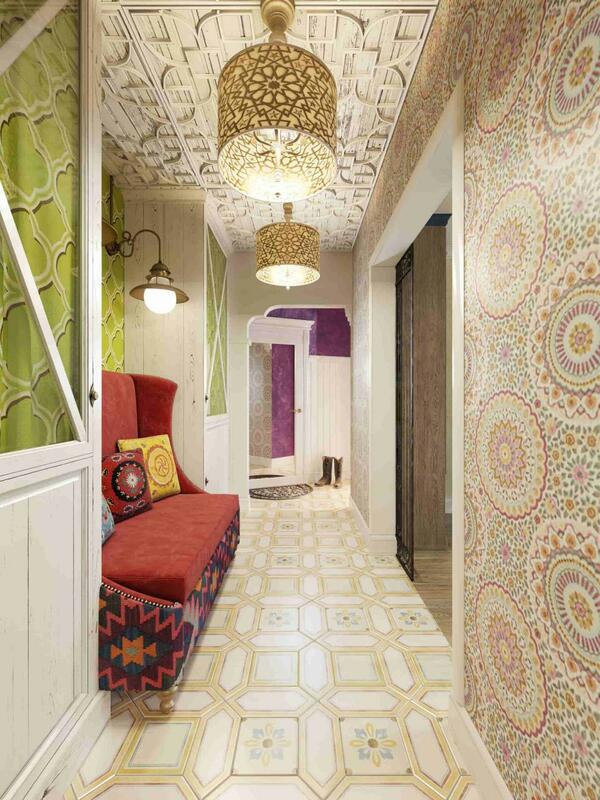 Decorative tiles deliver an ethnic look that’s welcomed for this design style. Here once again you shouldn’t be afraid to let yourself be mesmerized by intricate patterns and contrasting hues. Ceramic tiles need to be eye-catching if you wish to decorate your bathroom in Moroccan style. When selecting accessories, look at the elements already placed in the room for inspiration. Try to continue the design through similar patterns, shapes, and colors. As the Moroccan-styled room offers plenty of focal points, you can focus on simply enhancing the atmosphere and making it more inviting. A good example you should consider is the addition of burning candles or colored glass jugs. Displaying decorative items works well for this style and if you’re out of inspiration, look to decorative metalwork pieces. Whether you choose vases, kettles, or trays, items made of metal need to be featured for a truly authentic Moroccan look.It would be ideal if you find metal accessories that are hand-crafted in a traditional style. Another interesting decorative element which can offer an oasis-like vibe to the room is the presence of exotic plants. Place some papyrus or banana trees if you have the available space to keep their large pots. In this way, you should be able to nicely accent a home in the Moroccan style. Natural woven baskets can act as versatile accessories and they can fit well for a Moroccan-styled room. Large baskets can be even used for housing plants instead of conventional pots. For a finishing touch on any Moroccan interior, consider integrating some scented candles with sensual fragrances or spicy-smelling incense. These can have a transformative effect for the atmosphere in the room, making it resemble a Moroccan bazaar. If you enjoyed our article please don’t forget to share it with your friends and family because we put a lot of hard work in delivering the best tips for you. Also if you are more attracted to the modern or the scandinavian decor types, we recommend our articles about the industrial decor and hygge decor.